Key West Bed & Breakfasts! Let us invite you into "Courtney's Place Key West Historic Cottages & Inns". Courtney's Place is tucked away on a quiet lane in The Heart of Old Key West - just 1-1/2 blocks from world famous "Duval Street" and 7 blocks from Ocean to Ocean. Our Key West bed & breakfast is only minutes from all Key West attractions. Courtney's Place Key West has bed & breakfast accommodations to meet just about any ones need - from Cottages to just a Private Room. 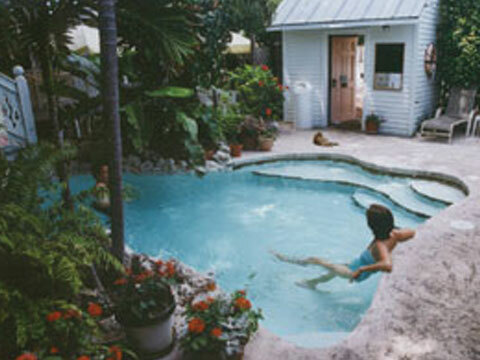 Courtney's Place Key West offers lots of amenities along with great rates. We are People Friendly, Children Friendly, Pet Friendly - in fact we are just plain FRIENDLY!!! We Welcome All - We work hard at making your Key West vacation enjoyable and memorable. Our goal is to make you feel at home by offering the personal touch you might not find in a larger setting - in short; Courtney's Place makes you feel like a guest, not a tourist. So, if you would like to experience the flavor of an authentic "Conch" neighborhood and be a Key West native, come unwind with us at Courtney's Place Key West. Courtney's Place Key West has been written up in the Washington Post and several other travel articles throughout the World. Most recently you will find us in Lynn Homan and Thomas Reilly's latest book - "Images of America" KEY WEST. AAA has given us a 2 Diamond Award.